Pam’s Pictorama Photo: I have devoted several posts to stars of film and stage wishing to enhance their appeal by posing with Felix, (see my posts Mistinguett – Felix Goes to the Dogs and Felix Makes the Picture Better among others) however Felix most frequently joined family gatherings in the late twenties and early thirties as shown here. The small photo is a new purchase, from Great Britain. (It is quite small, about 2.25″x3.25″ with nothing on the back.) The beach postcard scene is also from Great Britain I purchased a number of years ago. So, when I look at the small photo I ask myself – was the family taking a photo that was a knock off of those you paid for at beaches and resorts? Or was Felix just such a part of the family that they spontaneously included him? Their Felix is decidedly smaller than the one in the beach photo. He is a ‘home model’ if you will. Not unlike one (or two) I own. (A frequent fantasy of mine is finding one of these enormous Felix dolls like the ones in the beach photos – some the size of a small person! – and purchasing it. I thought I was on the trail of one once but alas, the trail went cold.) I like the cheeky looking girl in the plaid dress, standing above Felix. Makes you wonder if including him was her idea. And what’s with the kid on the fence a bit further down? Is he part of the family or did he just happen to be on the fence when they took the photo? The family in the beach photo is more prosperous looking. It is a much larger gathering and everyone is beautifully turned out, despite being at the beach. They have made that lovely sandcastle and I like the way they have tucked Felix in as part of the family (he almost looks like he’s holding the baby!) so it takes a moment or two to even see him at first. 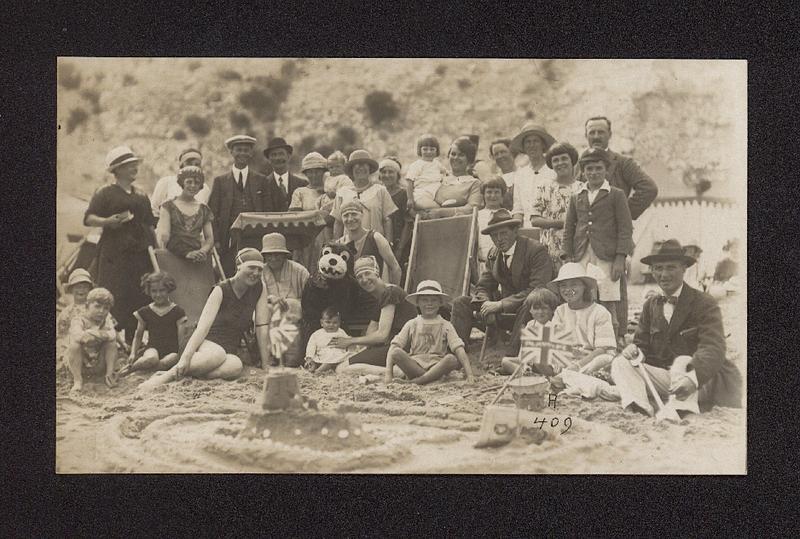 There is nothing written on the back of the postcard, but clearly it was a treasured photo of a large family gathering. Who wouldn’t want to join that party? Frankly, I can’t say we ever had family gatherings in my New Jersey childhood that lived up to that. It does set the bar high however.